« How can they possibly know that? One of the most lucrative markets in this industry is the GEAR! Just last week many specialists, operators, weekend warriors and the like traveled to Las Vegas to attend Shot Show 2012. Vendors from all over the world set up hi-tech booths to sell their wares, introduce the newest high speed gear that they convinced you that you needed or made your pre-existing gear better. Last week I went to Blue Ridge Arsenal to do my weekly shooting. While I was there I noticed a few guys wearing the Raven Phantom holster. 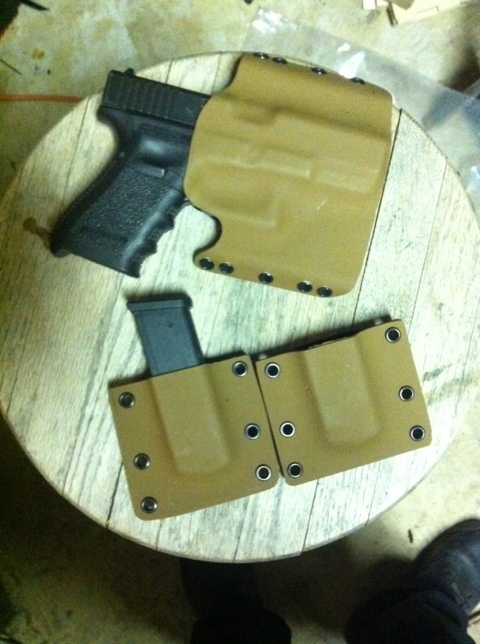 The Raven holster became popular in the Magpul Dynamics video with Travis Haley and Chris Costa. Obviously their use of the holster bolstered sales for the Phantom holster. To that point I also saw a review of the holster on YouTube where the guy purchased the holster online in April and didn’t receive it until August of that same year. WHAT! He was very happy with the holster when he finally got it. I researched their site and now they have a disclaimer that you will receive the Phantom within 45 days. That’s still a long time for me and sounds more like the turnaround for an out of stock item. When one of the shooters exited the range I asked if I could look at his Raven holster at which time he told me that it was not. He then pointed to the range master and said, “He made this for me in 2 days.” I looked closely at the holster with a quick pass and saw that the craftsmanship looked very well put together. I made it my business to wait for this craftsman to exit the range and talk to him. When he eventually came out I approached him about possibly having one made. The gentleman, Travis Hafner was very cordial and after about a 15 minute conversation I place a preliminary order to be followed up with a phone call. Travis and me spoke a couple times that week as I made custom adjustments to the way I wanted the Kydex holster to look, the draw and the cut. He sent me several pictures along the process that I posted on my social media networks. Yesterday I went to Blue Ridge Arsenal and picked up my holster. I will be getting my double magazine holder this week. As soon as I got to my car I removed my Serpa holster and put on the new tactical holster to check its comfort while driving. For me the gear has to work from all aspects, not just retention and/or concealment. We spend a good amount of time in and out of vehicles, so car comfort is just as important to me as concealment. For me, I can not wear an inside the waist holster. The concealment factor gets a 10 on a 1-10 scale. Comfort gets a 3 for me, and ability to access the gun is about a 2. The total score for an in the waist holster for me does not measure up to Eric Konohia test for usage. After I got the holster on I got in and out of the vehicle from every possible position that I could be working on a detail and did not feel the weapon rub against the seat OR the steering wheel as my Serpa occasionally did. This holster fits and wears like the old leather pancake holsters did. It fits tight against your body. The retention is in the Kydex itself and there is no searching for buttons, or snaps. As a disclaimer, I am not saying that retention buttons or mechanisms are not good or safe. But if you buy one of those holsters and do not practice drawing your weapon on a DAILY basis you are setting yourself up for failure in a seconds is life situation. I loaded the weapon and held it upside down over my bed and shook it very agressively without the weapon coming out. That’s good enough for me. Of course this is not the holster you want to buy if you are jumping out of planes or rapelling off of buildings, but this is perfect for what we do. Since my days as a Maryland State Trooper in the early 80’s I have easily bought or used over 20 holsters. As far as conceal carry holsters that I have ever used, this is my top choice EVER. I am working with Travis now to get his name out and to help with channeling his order requests. He is a 1 man operation with some assistance with a friend. Your holster is not 1 of 300 in a bundle order. He makes each one individually and it is YOURS. His turn around is within a week as he has regular full time employment, part-time employment at the range as fulfilling his military duties. If you are interested in a holster email me at info@bpigroupusa.com and I will submit your email to Travis. In your email please state what kind of weapon you have so that he can respond effectively.